There is only one way to arrive at Aloft London Excel; cruising into London City Airport sipping champagne onboard a private jet. As the wings dip ahead of the final descent, the awe inspiring panorama of the city’s skyline opens up between the clouds for a fleeting moment before the plane glides to a halt on the runway. A few moments leisurely passing through the arrivals hall, before a limousine whisks you to the front door of the hotel – opened earlier this year – where courteous staff show you to one of the 252 loft-like guest rooms. Well, that is the dream! For the majority – myself included – arriving via the notoriously fickle Docklands Light Railway is the more affordable option during these straightened times. But that is not to say the staff will be anything less than charming – even if you do lack a blacked-out limo. Differing transportation is also a neat illustration of the distinction between Aloft and its luxury stable mate W Hotels. While W is luxurious enough for those affluent enough to travel by private jet, Aloft caters to those who are on a tighter budget, but are still seeking the same focus on contemporary design, social guest experiences and urban locations. It seems guests like the idea too, with Aloft now operating over 50 properties worldwide followings its simultaneous worldwide launch in 2008. Such has been its rise, Aloft was nominated the World’s Leading Lifestyle Hotel by the World Travel Awards this year. The United States, Canada, China, the United Arab Emirates, India, Belgium and now the UK all have Aloft hotels in operation, while the expansion will continue with India, Thailand, Colombia and Costa Rica in the coming months. “Aloft’s emphasis on high design combined with its tech-savvy features and social atmosphere all at an affordable price point translates globally,” Brian McGuinness, senior vice president, speciality select brands for Aloft-operator Starwood, explained to Breaking Travel News. So what is Aloft like for guests? Well, the location of Aloft London Excel counts in its favour – although a sign from the DLR station wouldn’t go amiss! Close to City Airport, the DLR and a number of major roads into the centre London, the property seamlessly links the capital to Europe. ExCel International Exhibition & Conference Centre is also physically connected to the property – making it a perfect location for highflying executives with little time to spare. World Travel Market is perhaps the largest event held each year at the venue, but Aloft could also prove useful for visitors to anything from Top Gear Live to the Baby Shows or Grand Designs Live in 2012. The 02 Arena – the busiest concert venue in Europe – is also just across the water. Check-in is smart, efficient and welcoming, while downstairs guests mingle, play a game of pool or grab a drink in the atmospheric public spaces including the re:mix lounge and w xyz bar. Self-service check-in kiosks are also a boon. Upstairs in the guestrooms oversized windows offer views over the more industrial parts of the Thames, while an ultra-comfortable platform bed and large walk-in shower are both present and correct. Designed with the digital generation in mind, Aloft has free wireless internet access throughout the whole hotel, while the rooms are equipped with plug-and-play connectivity, turning each into a high-tech office as well as an entertainment centre. A smart, well-located business hotel with a keen fashion sense then. However, there are still some minor teething problems – yesterday’s newspapers in reception, no draft beer in the bars for example – but these will be ironed out. Of more concern is the re:fuel by Aloft concept, where guests are offered breakfast. On arrival you are given a token for breakfast – itself a system below a brand of this stature – allowing guests to select three, no more, items from a limited buffet. Chose anything except black filter coffee and you are down to two items for breakfast. Even downmarket hostels offer unlimited cereal included in the price. The re:charge fitness centre and Splash pool are both welcome highlights, providing excellent facilities more usually found in more up market brands. 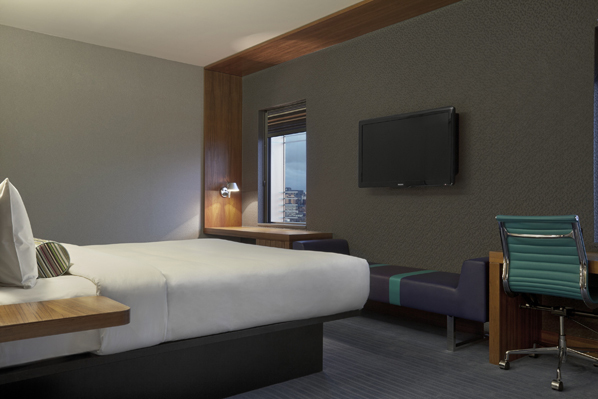 Focused on the business market, Aloft London Excel offers a warm welcome to the budget conscience but design savvy passing through the capital with limited time – even if you can’t afford to travel by private jet. Room prices start at £120 per night.